In response to a comment from Michael Jones I am posting a brief note about grid connection of homebrew wind turbines of my Recipe designs. The turbine output voltage depends on both the rpm and number of turns in the coils. It increases in exact proportion to both the number of turns and the speed of rotation. For battery chargers we must wind coils that produce 12,24 or 48 volts at the desired blade rpm. For grid connection we need to base our coil design on the input DC voltage range offered by the grid-connect inverter. I do not recommend using a battery based system for grid connection in Europe (although you can do it with a ‘Sunny Island’ inverter). In North America the Outback is worth looking at. But think hard before you buy into a battery-based grid-tie system. It shares the worst features of both battery systems and grid systems. The best way to connect to the grid is usually without batteries. I have offered suggestions for turns per coil and wire sizes for grid connected turbines using WindyBoy inverters sizes on page 36 of the Recipe Book. But I have never personally built a grid tied turbine on my own, because I live off-grid. I do understand the principles well, and I have helped many others to do it successfully. The people who have most hands on experience with work on my Recipe machines are Ti’eole in France. 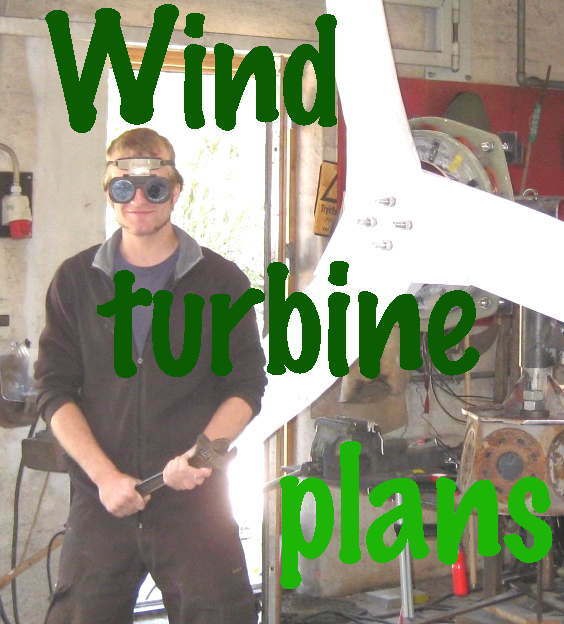 See also this post if you are building a 4200 diameter turbine. The main difference between a grid connected inverter (such as the Windy Boy or the Aurora) and a battery is that the inverter can accept a wide range of (often rather high) DC voltages that you can program in advance, whereas a battery works at a lower DC voltage that is arbitrarily fixed at a level that depends on its state of charge. Often the relatively constant battery voltage is not the ideal level for the wind turbine to be producing power at over a wide range of different windspeeds. It can be a bit like driving a car in the wrong gear. It may struggle or stall. With an inverter you can shift gears. The exact input voltage of an inverter can be programmed as a function of Watts using interface software, such as the above SMA program. Often this will be done by your supplier, but anyone can do it with a PC and a service cable. The idea is to set a voltage level for each power level (windspeed) that will achieve the correct rpm in the alternator to load the blades at their best tip speed ratio. I can offer help with choosing the best inverter settings based on your stator details. I can also supply inverters, and arrange for programming. Not only are the blades run at their best speed by the inverter, but the alternator can handle much higher peak power outputs compared with a battery charging alternator setup. This is because the alternator now works over a range of voltages. Wind turbines can only produce a relatively low voltage at low rpm, but the voltage naturally increases with speed so that the required current is relatively low in strong winds. The downside of working at high and variable voltages is that the turbine becomes a significant hazard to the inverter and to humans. If the inverter is not drawing current off the alternator then the blades will be unloaded and will overspeed, producing dangerously high voltages. You will need a ‘voltage clamp’ or ‘protection box’ that connects the turbine to a heater when the voltage reaches a certain level where it threatens to damage the inverter. 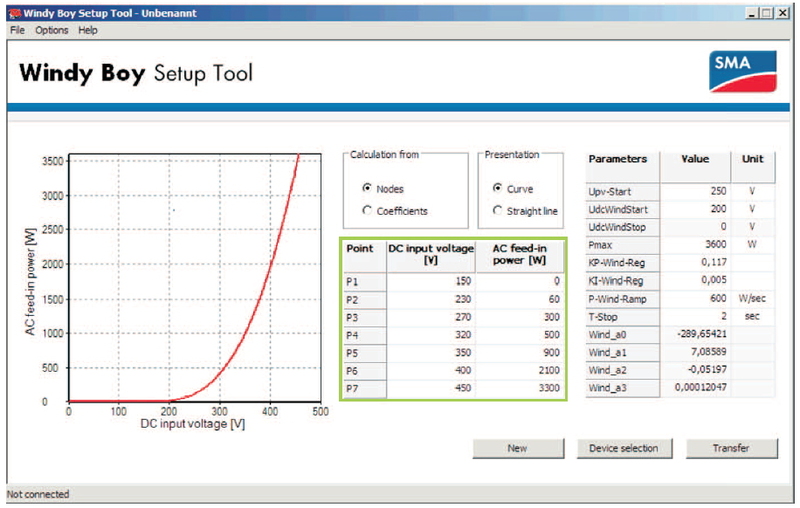 The voltage clamp works very like a diversion load controller on a battery system. It diverts current into heat, sufficient to prevent voltage rise above a set level. It relies on a large bank of capacitors. The inverter probably provides the capacitors, and should also be kept connected for this reason. Actually the protection box makes the wind turbine into a heating turbine that can also feed power to the grid. You really need that heating controller as a backup, since the grid is not a reliable load. But if all you wanted to do were to run heaters, you would probably choose a different setting on the heating control box so that it would come into action at lower voltage and run the blades more slowly. It’s wise the treat the wiring with respect too and makes sure there is good insulation and no chance of wires scuffing themselves on bare metal in the tower for example. This is a lethal voltage source and there is no means to wire in protection against faults. Other electronic equipment is available out there. I have used Solar Converter’s LDR controllers for both nverter protection and for heating systems. Smaller systems are often based on Windmaster 500 inverters working at 50-100 volts. there is no simple answer and you may need to use some trial and error. If the voltage is too low (for a given power) then you may stall the turbine so it is very quiet but does not achieve much. If the voltage is too high then it will run fast and noisy without a good output. You need to find the sweet spot between the two. Likely you will want to cut in around 100V and ramp it up to 250 volts for 3kW power. The curve should be hooked upward so maybe try 1kW at 200V, 200W at 150V or something like that. I appreciate all you are doing to promote ,encourage and champion wind energy in a pratical way. I almost built one of your turbines when a friend spotted a 2nd hand evance r9000 on ebay. It came with 2 windy boys a rectifier the tower and a load of cable. I to am off grid and have connected to a sunny island .i set the system up last january and it has worked well apart from the turbine ‘pitch’s’ its blades when the speed increases (a useful safety mechanism but it has the effect of stalling the turbine ).so i started to investigate voltage controlled ‘dump loads ‘and came across the windy boy protection box which looks like what I need . unfortunately when I contacted Steve at wind and sun he told me that S.M.A have gone out of wind energy and no longer sell w.b.p.boxes .do you know what I could do instead? Still a fan of cheap and agricultural if well built! Or there ought to be ways to divert the energy before the sunny island raises the frequency and dumps the windy boys. You could for example use a relay driver to control useful diversion loads based on battery voltage, or in some sunny islands there is even an internal relay setting for this. http://ambercontrol.com/index.php/amber-switch that could maybe put a load on before the windy boys start to moderate the wind input. How much does the windy boy and the windy boy protection box cost? or you can contact me and I can quote you a price. what is your recommendation for the best battery manufacturer? I am sorry but I don’t sell inverters in north america. I can sell them in Europe but I like to be able to offer good support and am really too busy to take on selling them that far away. Maybe try to find a more local supplier who has a good understanding of the product. I am happy as always to help with suggestions for settings etc. This is the first time that I have been on your blog. I have contacted you about building 2 turbines and if I should use 1 large or 2 small inverters. 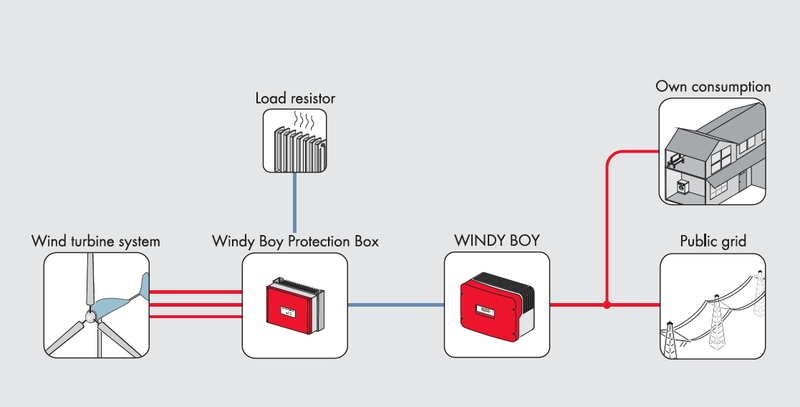 Am I correct in understanding that you handle Windyboy Inverters and Protection Boxes as well as programming them? I am going to build your 14′ turbine using the specification that are in your manual that I got from Craig and Connie Cook in Tillsonburg. These inverters seem to be well manufactured from what I have been able to find out. If you sell these units, do you have pricing available.